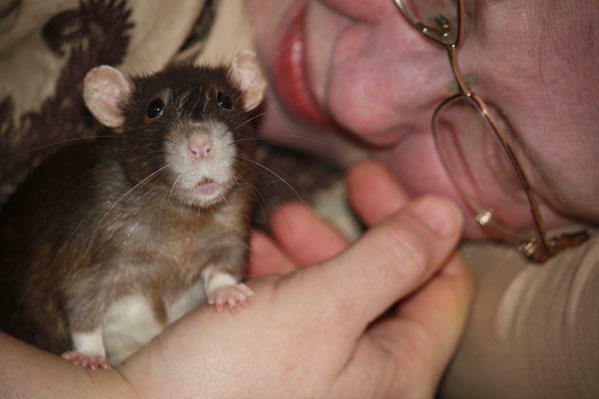 Dawn Burke cuddling with one of her rescued rats, Annie. Dawn Burke recounts how the Rat Retreat got started. “She asked if I wanted to see and I can’t resist meeting any animals. I went over there and they were so relaxed and soft and cuddly. She picked one up and asked if I wanted to hold it. I was a little scared, but I said sure. It looked safe. I held that rat against my chest and it was amazing. “Years later, when I was looking for an animal, because we had had cats and I had developed Muscular Dystrophy and wasn’t able to hold the cats very well or empty their litter boxes and didn’t have the energy to play with them, but we had been without an animal for four months. "I couldn’t stand it, I just had never been without animals. I just stopped by a pet shop on a whim. I’ve got to find something small and furry, not a fish. I had thought about mice or gerbils or hamsters, but went by the aquarium where they had the rats and saw the little black and white tiny things hopping up and down trying to get my attention. I remember that lady’s rat and I thought, 'Oh, rats! I never thought about that as a pet.' I asked them, 'Can I reach in and pick my own?' and I picked the one that seemed to want to come home with me the most. That was how I got Druscilla. Dawn Burke's first rat Druscilla taking a shoulder ride. “…and his friend Lex. The pet store called me and said they had a rat that got loose in the store and had been loose for six months, living on dog food. They were all afraid of him, they were afraid to touch him. Eating dog food, he was this huge guy. 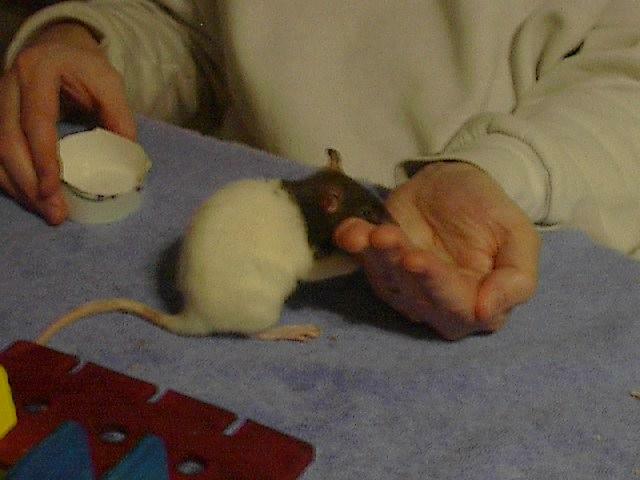 Druscilla snacks on honey and water from Don's hand. Dawn and her husband Don Burke have donated much of their time, money, and living space to rescued rats.